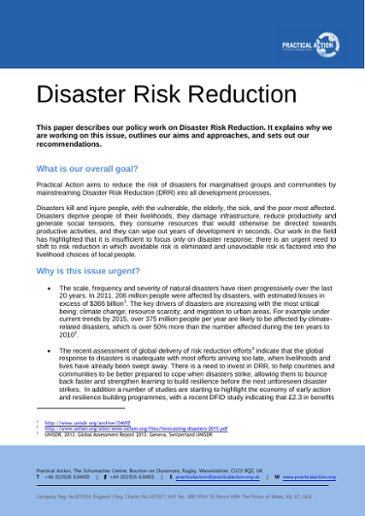 Disaster Risk Reduction is founded on the belief that whilst natural hazards are inevitable, the suffering and loss of life associated with them is not. Integrating risk reduction into development is critical for achieving sustainable development that delivers long lasting solutions for poor communities around the world. Disasters deprive people of their livelihoods, damaging infrastructure, lowering productivity and stirring social tensions. They consume resources that could otherwise be directed towards productive activities, and can wipe out years of development in seconds. Most disaster-related assistance arrives too late, when livelihoods and lives have already been swept away. There is an urgent need to change this trend and to invest in the reduction of risk before disaster strikes. By doing so, communities and countries will be better prepared to cope, and to bounce back faster. Practical Action works to help the most vulnerable groups, the poor and the marginalised, to prepare for hazards. We empower them to survive hazards and maintain livelihoods, to get their lives back on track as quickly as possible and plan for a better future. A systemic approach is critical to the success of our work. This means not working with communities in isolation, but bringing together all actors - including the private sector, and local and national governments - with a role to play in shaping the risk environment. 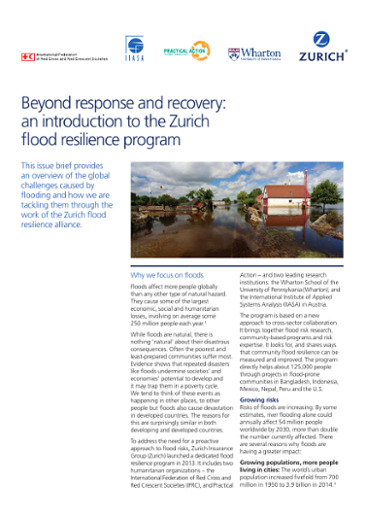 Only with a holistic approach will DRR be integrated into current and future development. 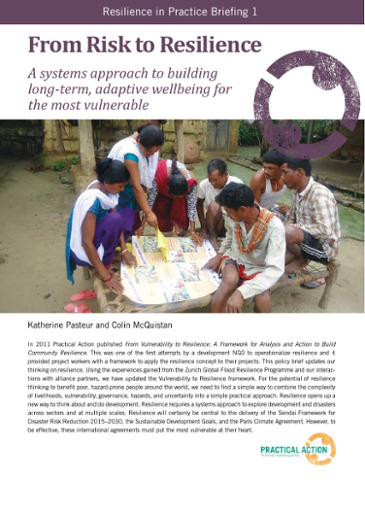 Our policy influencing approach to DRR is based on research and operational experience gained over many years in South Asia, Africa and Latin America. Central to our DRR work is using participatory approaches to involve people in decision-making, and technological innovation in line with the principles of technology justice. Participation and technology justice are critical to ensure a sustainable, fair and just future for all. We will put the poor and marginalised people at the centre of our efforts. Only by reducing the risk of the poorest and most vulnerable will the risk exposure of the whole community be reduced. We will work with all stakeholders including the private sector to understand the role that markets play in building the resilience or increasing the vulnerability of the poorest and most vulnerable. We will call on governments and other key stakeholders to integrate Disaster Risk Reduction into their policies. We will advocate for the concept of Resilience and the practice of DRR to be fully integrated into the post-2015 development agendas. We will promote the positive role that technology can play in disaster-sensitive development. Technology justice in DRR requires the involvement of the poorest and most vulnerable in the development of technological solutions that will deliver the biggest impacts. This requires a critical examination of how technology may reduce vulnerability, but also how the use of some technologies can exacerbate vulnerability, for example by degrading the local environment or contributing to climate change.